Saturday: 10 a.m. to 8:00 p.m.
**Doors lock 10 minutes prior to closing. Librarian for Communication, English, Global Studies and Languages, History, Military Science, Philosophy, and Religion. Librarian for Business, Economics, Education, Exercise Science, Music, Politics and Government, Psychology, Sociology and Theatre. Patron confidentiality is very important to us. We do not release the circulation history of any patron to anyone else, for any reason. We must, however, tell the business office the titles of fined, overdue materials when charging student accounts. Patrons may only take out items on their own account unless they have written, spoken, or standing consent of another patron (for example, a professor who often sends students over to pick up books). Ripon community members are welcome to use resources at Lane Library during the hours the library is open. To check out items, community members must be members of Friends of Lane Library. Due to restrictions from database vendors, we cannot offer use of databases other than our library catalog to community members. However, as a Federal and State depository library, Ripon College provides free public access to Federal and State depository material, both in print and on the computer. Patrons requiring access to government depository resources should inquire at the circulation desk. When computers are in high demand we ask that they only be used for academic work; anyone using a computer for non-academic work may be asked to allow another patron to use the computer. “Academic work” includes research using the Federal and State depository resources. The library is for all members of the Ripon College community. We ask that you act in a manner respectful of your fellow community members at all times when in the library. Anyone who does not may be asked to leave. Floors 1A, 1, 2A, 2, and the silent study room are designated quiet study areas. Please respect others’ need for a quiet environment by confining conversation to the main floor (3A) or the conference room (4), which offer many areas for groups to work together. Cell phone conversations are allowed in the library in the following locations: the front lobby, the stairwells, or the conference room. Food and covered drinks are permitted in the library as long as care is taken to keep library materials and furniture clean. Please respect your fellow students and don’t bring in food that has a strong smell (pizza, for example). There is a bulletin board in the main entrance for advertisements. Any advertisements posted outside of this area without consent of a librarian will be taken down. Students interested in working at the library should drop an application off at the front desk or email the completed form to Karlyn Schumacher: [email protected]. Tasks include processing, cataloging, and filing archival material, general maintenance of the college’s archival collection, and creating exhibits for the museum and library. 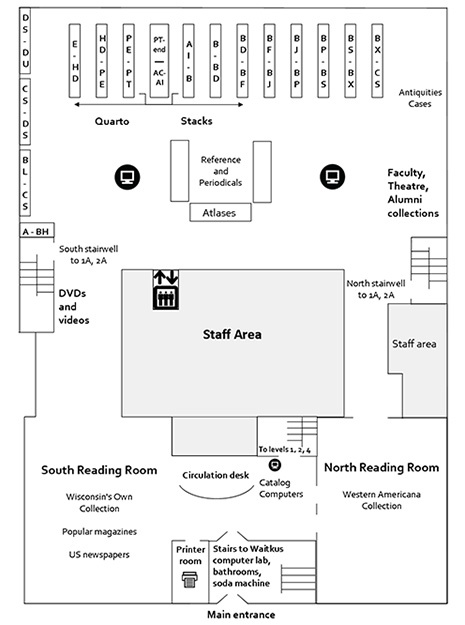 The person(s) in this position will be responsible for finding, editing, and downloading computer records for new books and materials in the Lane Library. Possibility of advanced work as priorities permit and the student shows potential. Assistants are responsible for customer service to library patrons during all open hours. The main tasks include checking out and in of library items, maintaining proper placement of all library items within the building, and helping patrons locate desired media. Other duties as assigned. Prepare and install displays in library cases at a rate of one to two displays per week. Process, catalog, and shelve government documents; may also assist with collection development for electronic government publications. Maintain incoming and outgoing interlibrary loan requests and ensure databases reflect circulation of these items. Locate books and articles via the worldwide web to fill patron requests. This position fills at least one hour per day each weekday. The person in this position will be responsible for preparing new materials to go out on the shelves. This includes stamping, security tagging, and securing spine labels to new collection materials. The position also involves shelving books, and other duties as assigned. Process and shelve the library’s journals, magazines, and newspapers. This position fills at least one hour each weekday morning.